Do you dislike the side effects of your high blood pressure medication? Acupuncture can lower your blood pressure naturally, allowing you to reduce your dosage or stop taking the medications entirely in some cases. How Does High Blood Pressure Affect Your Health? Prescription medications decrease high blood pressure in a variety of ways, including relaxing and opening blood vessels, slowing your heart rate and decreasing fluid and sodium in your body. Although these drugs are effective, they can cause unpleasant side effects, such as dizziness, fatigue, joint pain, lack of energy, dry mouth, headache, nausea, constipation and erectile dysfunction. Acupuncture offers an alternative way to lower your blood pressure with absolutely no side effects. Treatment involves placing hair-thin needles in your body to clear Qi blockages. Qi, a vital life force, travels through your body in a series of pathways called meridians. Inserting needles into specific meridians clears blockages, allowing Qi to flow freely once again. Needles are inserted in multiple parts of your body during your treatment, such as your knee, ears or between your toes. The treatment can improve your brain's ability to regulate hormones that play a part in controlling blood pressure and lower production of a kidney enzyme that can affect the electrolyte balance in your body. Acupuncture also reduces stress, a factor that may raise blood pressure to unhealthy levels. Weakness and dizziness don't just occur as a side effect of medications but are also symptoms of high blood pressure. After acupuncture treatment, you may discover that these symptoms lessen or stop. In addition to providing acupuncture treatments, your acupuncturist may recommend herbal medications that will help lower your blood pressure. Herbal remedies, in addition to changes in your diet, increase the effectiveness of your acupuncture treatments. Because high blood pressure doesn't just affect your blood vessels, acupuncturists consider the whole body when making recommendations. During your first treatment session, you'll be asked questions about your medical history, current health and symptoms, career, stress level, and lifestyle. Answers to these questions will help your acupuncturist identify any underlying issues that may contribute to your symptoms, such as a yin-yang imbalance. For example, weak yin can cause inflammation, which may be a factor in high blood pressure. Balancing the opposing forces of yin and yang can help you enjoy optimal health, lower chronic inflammation and reduce your blood pressure. 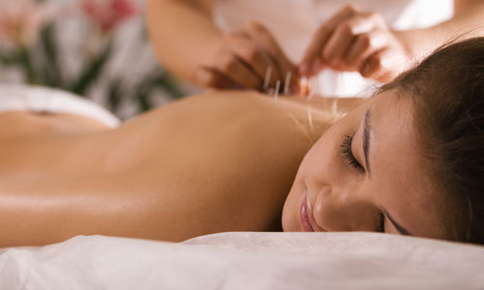 Do Acupuncture Treatments Really Make a Difference? Although the effects of treatments may vary from person to person, acupuncture offers a proven way to lower blood pressure. Researchers at Jiaozuo Tongren Hospital compared the effectiveness of the blood pressure medication nifedipine to acupuncture treatment. Although nifedipine initially lowered systolic and diastolic blood pressure more rapidly, the researchers reported no differences when blood pressure was measured at 30 and 60 minutes after treatment. Patients who had very high blood pressure noticed a significant decrease in blood pressure after acupuncture treatment, while those with moderately high blood pressure experienced more moderate results. In a study published in Acupuncture and Electro-Therapeutics Research in 2013, patients who received electroacupuncture treatments for one month experienced significant reductions in blood pressure. Electroacupuncture involves attaching electrodes to acupuncture needles. The electrodes produce a low-voltage electrical current that stimulates Qi and enhances the effect of the treatment. Although you might notice a pulsating or vibrating sensation when the current is turned on, electroacupuncture isn't painful. Regular acupuncture sessions just may help you decrease your reliance on blood pressure medications and may even lower your pressure enough that you no longer need medications. Would you like to find out if you're a good candidate for acupuncture treatments? Call our office today to schedule your consultation.